In the second half of the 20th century thatched properties have increasingly become desirable homes. Ironically, buildings that were built from relatively cheap materials are now some of the most expensive due to their aesthetic value and historic identity. Ask anyone to describe the quintessential English village and they will mention a thatched cottage. ‘Thatched’ is within our collective, traditional vocabulary and understanding. Due to their special architectural or historic interest, many thatch buildings are listed. This means that consent is needed for any alterations that could affect their character, including some repair work. › Click here to read more about Legislation & Planning with regard to listed thatched buildings. 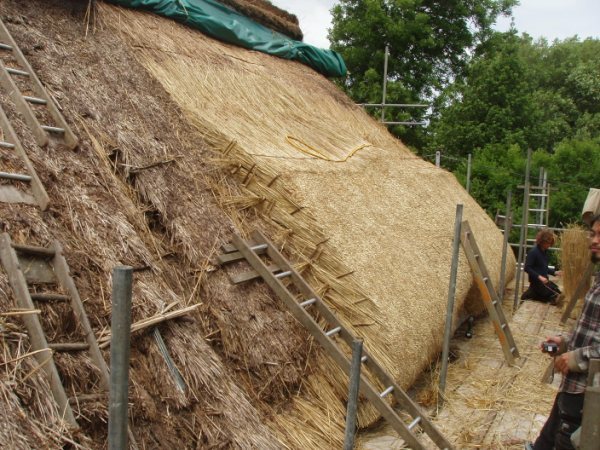 Like most building materials, thatch will deteriorate over time. Inevitably it needs to be maintained, repaired or renewed over the course of the building’s lifespan to perform its protective function. CoTTG believes in conserving traditional thatch, its methods and materials. Conservation is the process of managing change to a significant place in its setting so as to best sustain its heritage values, while recognising opportunities to reveal or reinforce those values for present and future generations. The following sections give guidance on monitoring, understanding and looking after thatch.